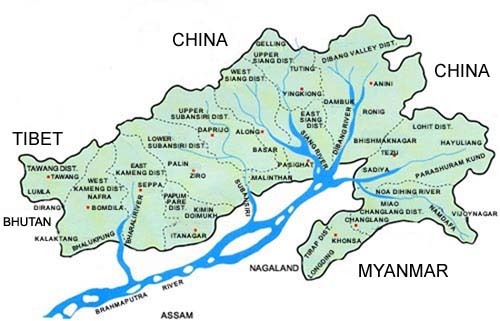 Arunachal Pradesh is an integral part of India on its North-Eastern periphery bordering China, Bhutan and Myanmar and is therefore a strategically significant State in India's strategic calculus. China disputes the Sino-Indian border that runs along the Himalayan Range extending from Bhutan to Myanmar. China went a step further in 2006 when the Chinese Ambassador to India on the eve of the visit of the Chinese President to India claimed the whole of Arunachal Pradesh as part of China. Historically, the flight of the Dalai Lama in 1959 to India to escape Chinese persecution was through the Tawang route. In the 1962 Sino-Indian War the Tawang Sector was the main area of military invasion by China. All these combination of facts highlight the significance of Tawang and its spiritual and strategic significance to India besides sending elected representatives to the Indian Parliament. The visit of the Indian Prime Minister, Dr Manmohan Singh this week soon after his visit to China was a welcome step to re-emphasise India's sovereignty over Arunachal Pradesh.. Coming after a gap of nine years since Arunachal Pradesh was last visited by an Indian Prime Minister it highlighted that Arunachal Pradesh was not a backyard of India politically and strategically and that its economic development needed to be put on a fast track. Regrettably, the political and strategic lustre of the Indian Prime Minister's visit to Arunachal Pradesh has been lost by his omission to include a visit to Tawang whose significance stands pointed out above .A visit to Kibithoo lying seven miles from the Chinese border does not compensate the Indian Prime Minister not including Tawang as part of his Arunachal Pradesh visit program. In fact the Indian Prime Minister need not have visited any place in Arunachal Pradesh but Tawang, so heavily it is invested with political, spiritual and strategic significance. The Indian Prime Minister by avoiding to visit Tawang has sent disturbing signals which have a bearing on India's security. In relation to the Sino-Indian border dispute context by not visiting Tawang the Indian Prime Minister may have provided China with wrong signals that India may be amenable to submit to China's territorial claims over Tawang. It would distort India's stated stands in the border dispute negotiations that Tawang and Arunachal Pradesh are non-negotiable. In the more broader context of India's external affairs attitudes it displays that India is unable to stand upto China in the regional context leave alone the global context. How can India then manifest its ambitions to be a lead player in global affairs? Politically, in the context of India's domestic political dynamics, the Indian Prime Minister has sent disturbing signals to the Indian public that once again a Congress Party Prime Minister in the Nehruvian mould has buckled to China's strategic dictates on the Sino-Indian border dispute. It once again sends wrong signals that India's political leadership continues to be feeble-hearted and strategically naive and that India is therefore susceptible to external pressures. The Indian Prime Minister's advisers on national security affairs and I do not think this includes any uniformed gentlemen have horribly gone wrong on advising him not to include Tawang in his program to visit to Arunachal Pradesh. Tawang and Arunachal Pradesh like the rest of Indian territory under illegal Chinese occupation is non-negotiable and cannot be bartered away by any Prime Minister of any political dispensation. The Indian public would not accept any symbolic dilution of this fact. So as to not to let the strategic misperceptions linger both in the domestic political context and to send strong messages in the foreign policy context a quick visit by the Indian Prime Minister to Tawang in the near future is a strategic imperative. Indians visiting Arunachala Pradesh are required to get entry pass . Is it correct ?